I got an email from Sue Roddis yesterday, telling me that I inspired her. SWEET! I think the body is extra special with the added text. I LOVE this!! She used my studio 490 funky flowers for tailfeathers...and she also added the leaves from the Life and Art set. Doesn't she look comfy sitting in her nest? BEWARE! These birds are addicting! The funky flowers also make a cool HAT. And here you see that Sue again used the leaves to embellish her art base. This is awesome Sue!! Thanks for sharing with us! I had no clue how happy it would make me to see others use my stamps. 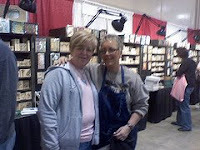 Bonnie Egenton, Ranger's Marketing Director, did 2 videos and used my stamps to demo some Perfect Pearls techniques. YIPPEE!! The Ranger site is loaded with tons of FREE info & videos. and a Columbus report...that's me with a blog friend, Nancy...she is HILARIOUS! I think you'll be seeing lots of grunge flowers in Ohio! Stampers Anonymous has LOTS of SPECIAL orders to send out too...these gals cleared out the booth! THANKS to everyone who attended and visited our booth. These pigment inks give chipboard (Maya Road...of course) a totally different look, since it's opaque. It's simple to tap the pads right on the chipboard. These are quick drying pigment inks...about 15 minutes on porous surfaces...or if you're in a hurry like me...a quick blast with the heat tool & you're all ready to embellish. After it's dry...I stamp with jet black archival for a nice crisp image. Other credits for this piece...the striped paper is graphic45...the green base is bazzill's swiss dot cardstock. I forgot to memtion this last week. I did blog post for the Maya Road DT blog. It's there plus 3 other versions of the same flower. The post is here...one flower...4 fun ways. 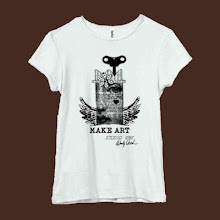 every piece is a blank slate & can be...ANYTHING! The first is from Nancy Wethington, a St. Louis friend...she made it to document her son's return home from the service. The first is a gift for her friend...how cool is that? Hmmm...looks to me like she's a Maya Road addict too...and she likes my stamps! THANKS NANCY & CAT...keep up the GREAT work! Next stop on the art adventure is Scrapaganza in Iowa. 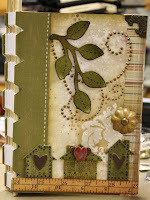 a fun Maya Road book, the funky flowers grunge class and the use your scraps fragment journal. I thought I'd make a few samples for the booth. 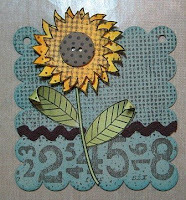 This background was fun...sort of a mini sampler of studio 490 background stamps. the base is a scalloped coaster. tim's idea-ology snaps added the finishing touch. The flower is from the blossoms 2 tin...and it was run thru the Cuttlebug folder, then inked using Ranger's blending tool. The stamps?? studio 490, of course! The yummy brown flower is Maya Road's beaded felt blossom. Since Memories Expo is a scrapbook convention...what if people expect to see layouts in the booth? FAMILY is spelled with Maya Road's brand new mini jonathan alphabet. I used tim's new metal corners and if you look close...there's a trinket pin in there too. I'm off early tomorrow...REALLY early...like 4am??? YIKES! If you're close to Columbus...please stop by & say HI! It's fun to put a name to the face...and to meet blog friends. I'm planning to meet some friends from 2peas there too! Can't wait! Mr. Stampers Anonymous will be doing demos ...stop by...tell him that I said HI! I guarantee...he WILL make you laugh! Sound like something to eat? NOPE...It's Ranger's new PIGMENT inks...I made a little something & I LOVE these new earthtone colors...stay tuned...I'll show you on Monday. Since my studio was featured in Cloth Paper Scissors "studios" special issue, I've had several requests for more photos. "would you open EVERY drawer & show us what's inside?".. But I did find these lost photos, taken by Jake Krancic. I'd REALLY like to add on...but don't tell Rick. 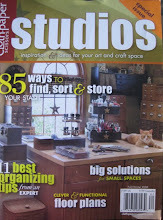 The next "studios" issue will be on the newstands or in your mailbox on March 31st. Guess who has a 6 page spread??? The first name starts with a "T"
ps...today I'm working on studio 490 stamp release #3!! The ART of the ...? Have you seen tim's new idea-ology corners?? The base is Maya Road's scallop journaling coaster. I inked it with broken china, then added some vintage photo distress ink over it. 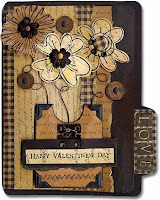 The background was stamped with my studio 490 bingo background stamp, using jet black archival ink. I lightly ran a gold paint dabber around the edge & it's hung with idea-ology link chain. the black cardstock is edged again with the gold paint dabber. Here's a closer shot of the flower...see how 4 corners make a flower? This is a project that I made for Maya Road & it was being returned from the Scrapbooking & Beyond folks. USE THOSE SCRAPS...DON'T TOSS THEM! All the rub-ons on top of the fragments are made by Maya Road...as is the large scroll under the knob. I am NOT prejudice when I say they are wonderful quality. They are simple to apply & they really do stay in place. jet black & coffee archival inks...2 MUST haves. Glossy Accents...for adhering the paper to the back of the fragment & also for adhering the fragment to the lid. 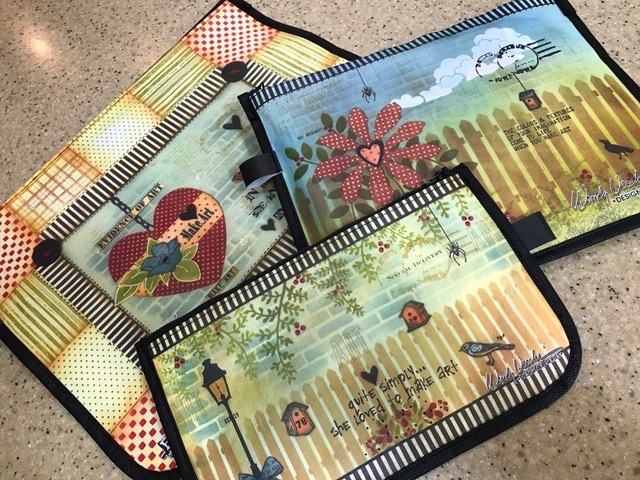 The paper is from Melissa Frances & the pattern names are Gilbert, Sandra, Thomas & Wesley. The knob is made by 7 gypsies. I used the black glaze pen from Sakura to add dots to the fragments. just as soon as the box gets delivered. Here's Samantha...the 12 year old guest demo artist in Carson this past weekend. She's cute, smart & very sweet...and she's a GREAT stamper too. Nice & convenient for her living in California...she picked up her order right from Ted & has them in stock. Next is a little...very little peek. so I don't want to spoil the surprise. Just as soon as I hear the box arrived...I'll show the whole piece. Off to the tax lady today....YUCK! That's @ the top of the UGLY list! It seems that studio 490 stamps were accidently NOT loaded on the truck that was @ the Rockford, Illinois convention this past weekend. So for those who left comments, but don't have an email contact listed on the blogger profile...please email wbv1213@hughes.net. Ted said that you can place an order & he will ship it for free. 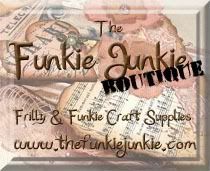 They are SWAMPED with stamp orders & he will send the stamps asap to the 2 lucky gals who won my blog drawing. Thanks so much for understanding. I got to visit with some friends...meet some blog friends and also some 2 peas stampers. What FUN!!! I also got to meet CAT from Cat's Craft Cupboard...we've chatted via email, so it was fun to put a face to the name. At the end of Sunday there were NO studio 490 stamps left!! We started with 160 packages of grungePAPER...sold them ALL in just 4 hours. She made a grungePAPER flower & did an awesome job. 60 packages of PLAIN grungeBOARD sheets...gone! ALL the jewel flowers, jewel pins and TONS of chipboard stuff have a new home. Perfect Pearls were a HUGE hit...they loved the glitz! So...that's my story...and I'm sticking to it! 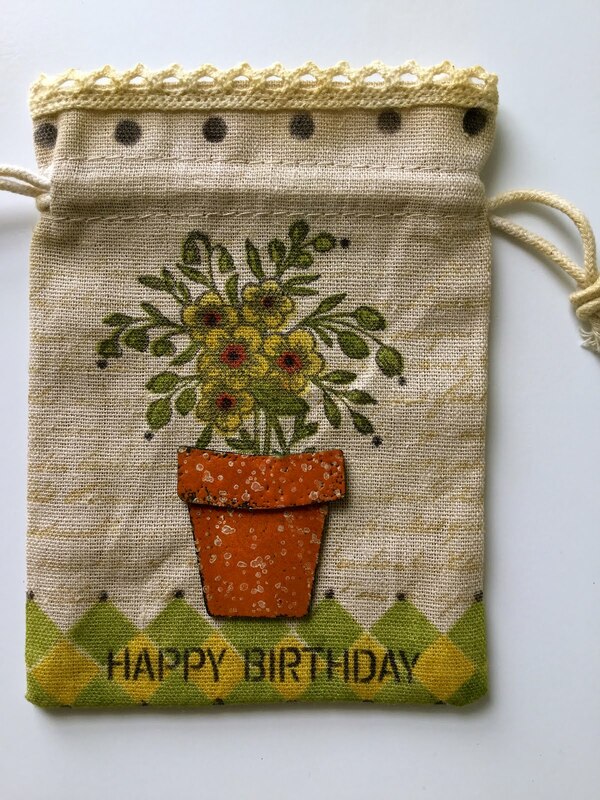 Here's another little sample for the Stampers Anonymous booth...a gift tag. This uses my MOST FAVORITE (REALLY!!) new Maya Road product...mini chipboard alphas...this font is Jonathan...the other mini choices are Noah (skinny font) and David. I'm happy to have several choices to mix & match...I have wanted these for a LONGGGGGG time. All 3 flowers are Maya Road...the large is inked with broken china & it's stamped with the studio 490 bingo background. The medium is scattered straw & my polka dot background. I LOVE LOVE LOVE black flowers! I used my gingham background stamp on the letters & also to make a small border @ the top. Jet black archival ink for that. It's my civic DUTY to help the economy. ps...If you come to the convention...stop by the Stampers Anonymous booth & say hi! These are 2 more samples for our Stampers Anonymous booth @ Carson, for this weekend. The scrolls are studio 490...the background is the screen stamp(studio 490) and the tiny bit of handwriting is also a studio 490 background. The flower is stamped (studio 490) on grungePAPER & inked with broken china. The leaves(studio 490) were stamped on grungeBOARD, then overstamped with the gingham background (studio 490) & they are peeled paint distress ink. The metal flowers are from tim's new idea-ology release...I like the snaps as flower centers. A PERFECT fit! The smaller flower is broken china with a bit of vintage photo added. The combo of vintage photo & broken china makes a great teal color. For a final detail...Ranger's gold dabber paint was randomly swiped along the scallops. NOTICE...the art supplies come first! PRIORITIES! Ok...we're back in business, after a trip to the camera MD...phew...I didn't want a new camera...I like this one. Since Stampers Anonymous will be @ 2 conventions this weekend (Rockford Illinois & Carson, California)...we needed more samples for the booths. I got it in earlier in the post today...surprise! Here's a fun little hanging, made with Maya Road's new rectangle scallop journaling coaster. I picked up some fun...ODD sized mini canvases in California and this turned out to be the perfect fit. change the colors...now it's no longer a poinsettia. Add another addiction to the list...BIRDS! I traced an extra wing onto a scrap of grungePAPER, stamped it with the bingo background stamp & added it for the finishing touch. Just a little dimension makes a BIG difference. GrungePAPER locating info is in yesterday's post. I'm happy that some of you ordered & have it coming. ***UPDATED@ 12:15*** I just talked to Daisy...only a few packages left. She expects to be SOLD OUT today..If you haven't found it yet...HURRY! and she has grungePAPER in stock, as of this moment. Hurry on over & get it before it's gone. The next shipment isn't due until late April...beginning of May. She also has the new Graphic 45 papers there...I'm hearing that they are hard to find too?? 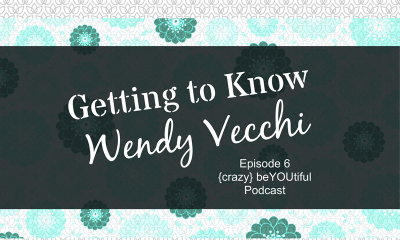 I just want my blog friends to be informed...and to get some fun stuff before it's gone! We had another fun FLOWERY class @ Scrapadoodle in Peoria, Illinois on Saturday. Thanks to ALL for the great turn out! These lucky gals got to play with tim's new grungePAPER...and make studio 490 flowers. I warned them before class...flowers & grunge= addicting...They believe me now. I REALLY did want to show you...HONEST! ...ha! So this is the best I could do for a new one. Guaranteed to make you laugh. ps...Suze sent the site...Here's the info, if you want to play. So...here's a little card/gift hanging...guess what? The distress ink colors for the base are...brushed corduroy, vintage photo, broken china....blended with the blending tool. I added black soot to add some depth, with more added at the bottom to ground the flowers. It was super easy to add a gold edge, using the paint dabber from Ranger. The leaves are peeled paint...the large flower is broken china & the tiny red one is mahogany. That sunflower looking one is mustard seed. That's tim's mask in the center...that was FUN! Almost all the stamps are studio 490, except for "dear friend". The script stamp @ the bottom is from tim's new release. ***THANK YOU SO MUCH for all the comments & emails about my birds. I spoke with Ted (Mr. SA) yesterday & he has a surprise for those attending that convention..
all for your shopping pleasure. ha! And there are LOTS of samples in the booth, to get the ideas flowing. when is a flower...not a flower...and an edit! That's my Holiday Hideaway tele-bird above. but I wanted to change it up & make it studio 490 style. When is a flower NOT a flower??? stamped grungepaper tail and a flower hat. What you can't see on the photo, is that the Maya Road metal flower spins.. Kind of funny! AH.........the perfect place to carry a spare crown. look beyond the obvious stamp and build a bird. See why I didn't want to tackle the uglies on the TO-DO list?? I Love the colors...they're perfect for spring! WAIT...I'll always LOVE these colors...who am I kidding? a very cool new trinket from Ranger. I think there are just a few open spots. in Columbia South Carolina....just yesterday. One of the things I worked on yesterday was updating my bio for.....?? I've only entered one contest...now I had to find the date. 2 years? A little more?? Hero Art's Hearts & Love contest. 2005?? Really? Time flies when you're making art! When is a flower NOT a flower?? working on taxes & writing instructions. I LOVE to teach, but hate writing the instructions. I'm MUCH rather have inky fingers..
Today's art was totally inspired by tim's new video. He demoed this new technique @ CHA...using alcohol inks & canned air. I watched the video & HAD to grab that air can...immediately! tim does the technique on Ranger's glossy paper & it's very cool. Here's my version of the technique, using the largest fragment, instead of the glossy paper. I did the exact same technique...dripped the alcohol ink on the top of the fragement, then blasted it with the air. There's also lettuce and a bit of denim. I used a printed white paper, with a script on it...to make the colors pop. It was easy to edge the fragment with an Adirondack silver dabber. So... I grabbed the pesto & latte...dripped it on the fragment & blasted the air. Now the cool thing about the alcohol ink/fragment combo...is that you can easily create dimension by stamping on the BACK of the fragment. I used a studio 490 background stamp and Jet Black Archival Ink, by Ranger. The alcohol ink is transparent, so the stamping shows up perfectly. It adds another layer & definitely makes a difference. And no project is complete without a flower...no surprise there. I hope this photo shows you that the stamping is under the alcohol ink. I used a kraft colored background paper to give it more of a vintage look. Just a few dots, using the glaze pen finished it off. Ah........this looks like me now! alcohol blending solution removes everything and you can start over. taxes tomorrow...unless I watch another video.